Do you have a child who loves arts and crafts? If you’re looking for a gift for an artsy kid, I have an epic guide of art and craft supplies for kids to fill all their creative senses. 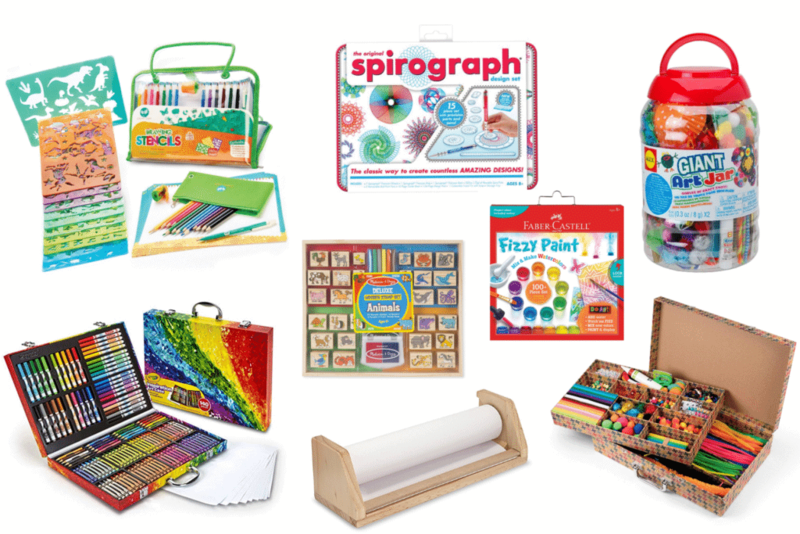 These are the perfect gifts for kids who love arts and crafts. My son is a complete nut about arts and crafts. No, I don’t think that accurately encapsulates his passion for arts and crafts. He lives for them so much that I’ve had to hide the glue and paint materials in our house because I can’t have one more ruined carpet, rug or piece of furniture as a result of his masterpieces. 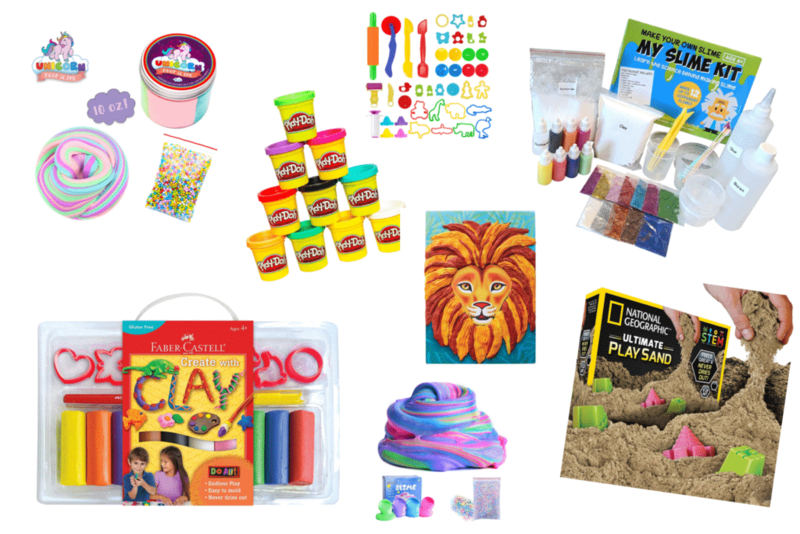 This holiday season, and basically every birthday, I do my fair share of digging around to find the best arts and crafts supplies to spur his creativity and stoke his imagination. A lot of these we have in our own house and I can stand by how great they are. This is a epic list of the best gifts for kids who love arts and crafts. These multi-functional Non-Toxic Crayons are great for drawing or painting: Crayon, Pastel(add little water), or creating a Watercolor(add a little water) masterpiece. Washable Finger Paints are a staple in every artist’s art collection. The key is that they’re washable and can come off clothes, counters, floors and furniture too! Of course blunt tip scissors are a basic art supply but if you want to jazz things up, these decorative edge scissors are perfect for added pizzazz to art projects. Big Paint Brushes with thick handles make it easy for little hands to grip and steer materials around. Watercolors, water-based paint is easy for every age to use and the colors dissolve and blend easily on paper. Oil Pastel Coloring Sticks are perfect for kids who want to explore new textiles and learn how to smudge colors together for a masterpiece. No set is complete with colored pencils and this set of 120 Colored Pencils is the ultimate kit to getting started. No Spill Paint Cups make arts and crafts less messy and with the dual lid and air tight lock make storing paint easy. Painting smocks are a must if you’re creating art! These full-length art aprons keep clothes clean and the mess on the paper. An Art Caddy keeps all your supplies neat and tidy, although with little ones, you might want to keep the paint out of reach in a different spot. 48 Rolls of Wasabi Tape can add flash and WOW to every art project! This Huge Stencil Set includes 12 stencils boards, 13 colored pencils, a sketchpad, a sharpener, a mechanical pen and a pencil case. Storage and carrying around is also made easy with a clear zippered bag. Spirograph’s distinctive interlocking gears and wheels, anyone can draw elegant, spiraling designs. Includes 7 wheels and 1 rings to make unique designs. This Giant Art Jar full supplies has all the supplementary art to accessorize any masterpieces. 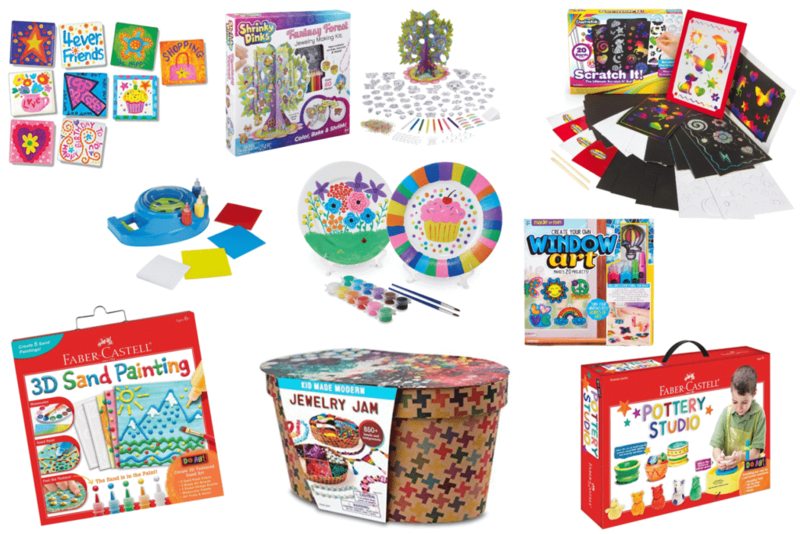 Comes with felt shapes, craft sticks, google eyes, buttons, spools, colored and textured papers, glue stick, glitter glue, craft scissors, paper plates, paper bags, feathers, pom poms, ric rac, pipe cleaners, sequins, stickers, fabric flowers, and foam shapes. 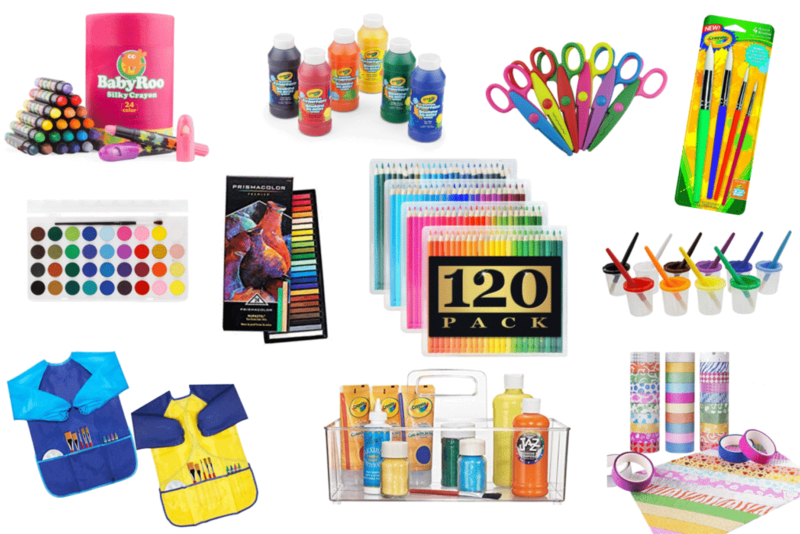 This mega Crayola Set is great to carry with you anywhere and comes with 64 Crayola Crayons, 20 Short Colored Pencils, 40 Washable Markers, 1 Art Storage Case, and 15 Large Sheets of Paper. Animal Stamps are a coveted art accessory in our house. Stamps go with basically everything and this cute set from Melissa & Doug is just the right size. No art table is complete without a never-ending roll of paper to color on. The Paper Roll from Melissa & Doug is handy for storage and holds up to 75 feet of usable paper to doodle, paint and decorate with. Jumbo Art Set Case is easy to fold up and take with you (hello waiting rooms and oil changes with the kids in tow) and includes case includes beads and sequins, fuzzy sticks, pom poms, felt pieces, wooden dowels, floss, googly eyes, sticker back jewels, wooden discs, craft sticks, scissors, needles, and glue tube. We’ve had this art case for two years and still haven’t used all the supplies inside yet! Magnetic Tiles are so easy, even my three year old got in on the fun. Create works of art, attach them to tiles and apply magnets to hang them on any metal surface. My kids are obsessed with Shrinky Dinks. The way they work is you color the plastic pictures and then pop them in the oven and they shrunk down to jewelry sized charms to put on necklaces, bracelets or give to friends. Scratch It Activity Sheets come with 20 scratch sheets and two utensils to create one-of-a-kind unique artwork. The Art Spinner is surprisingly mess-free when we tested it out. But it creates super cool spin art painting which can be used as cards or artwork. No batteries required, the spinner is kid-powered. Paint Your Own Plates is not only a great activity for every little art enthusiast, but it’s a fun keepsake for parents to hold onto as well. 3D Sand Painting is super simple to use. There’s sand in the paint which gives it the raised, 3-D effect. This sand art activity kit features easy to use squeeze paint tubes to create 5 textured pictures. Jewelry Supplies Box includes over 850 beads and supplies for kids to make their own necklaces, jewelry and decorative pieces. Hours of entertainment in a box! Fluffy Unicorn Poop Slime is a fun rainbow floam comes in four colors and lets you create your own unicorn slime masterpiece! Play dough is the ultimate entertainment for kids. Non-toxic modeling play dough in a variety of colors give kids the freedom to let their imaginations run wild. Pair play dough with tools, cutters and molds like in this set, or grab a sweet set like the pizza party, sweet shoppe cookie creation or this Drill and Fill dentists set. Making Your Own Slime is all the rage these days. This DIY set gives kids the chance to make different types of slime with clay, foam balls, with so many colors to choose from! 7 varieties of slime color and 12 glitter packs, mixing containers, slime storage containers, and so much more! Great for gifting! This modeling clay kit comes with everything a young sculptor needs to get started. Kit includes: 10 clay colors (red, yellow, blue, green, orange, pink, purple, white, black and brown), rolling tool, 8 shape cutters, texture plates and push molds – all housed in a reusable storage case. Make Your Own Colorful Fluffy Slime (without borax) can be made with or without the floam balls. Fluffy Floam Slime exercise the kids’coordination ability with hands, eyes and brain and develop the kids’ creativity and imagination. This Kinetic Sand sticks only to itself and not to you! This perpetually “wet” sand is perfect to mold, shape, and squeeze and cleans up super easily without any mess. Modeling Clay Picture Set comes with a picture and kids “paint” with modeling clay on top of the image to create a truly unique 3-D masterpiece.